Incredibly, despite being savages that only want to kill for apparently no specific burning reason other than that fact that you are not ISIS, ISIS has at least some kind of production department that can skillfully provide what could be considered Hollywood style editing (of supposed beheading videos) with multiple camera angles, consistent daylight on their subjects and proper daylight mode video exposure. They clearly have the skills for setting up multiple cameras and using those precise angles for their production department. In order to put out these supposed beheading videos, they also had to make sure that the sounds were just right and that there was no shaking of the camera. Someone then had to take the various video angles and properly edit the footage so as to make it look professional. The editor, apparently a man of class and decency, then is careful not to show any actual action and blood. Like savage killers who are ALSO respectful and classy about being too disturbing with their videos. Instead they courteously (but sloppily) cut from the early hand action of their British sounding supposed lead man, to the post beheading amazingly clean shot of a head sitting on a corp with the classic Photoshop drop shadows. In Hollywood style, reminiscent of Alfred Hitchcock films, the editor essentially leaves the action to the viewers imagination. Even though this beheading movie created by ISIS is not being submitted for any film festivals, they carefully comply with techniques that would make this film fully acceptable into almost any gore film festival. As for those who want to criticize the film. To those who want to point out to viewers the amazing lack of blood during those first critical throat slices of James Foley's neck, sorry, exposing this lack of blood is in itself apparently too grotesque by YouTube standards and should you post such a video it will be conveniently removed. Like the editing software, ISIS production team shows off their skills in Photoshop image editing software, which often requires an extended learning period, resources, and practice. Despite a few imperfections ISIS production department seems to know how to cut and splice out sections of images to produce the desired effect of disconnecting a head from the body. Even if obtaining and using the software is believable, let's remember we're talking about savage "terrorists" that are supposedly inhumane and don't regard human life. In other words, these are clinically factually document psychopaths not your average person according to government legend. Let's keep this in mind (psychopaths) when speaking about ISIS. According to U.S. "intelligence sources" mouthpieces, ISIS has all the above including social media capabilities. Amazingly, these covered face killers have unraveled the secret on how to outsmart every world power including the U.S. Empire with regard to every form of communication. They have stomped out the U.S. military, NSA, CIA, NATO, U.N. and the intelligence of Israel, U.K. and every other nation that surrounds them. You may think it's not every day that a small group of young face-covered kids can outsmart the world, but this could be attributed to pure luck if you believe in the ISIS psyop. Just to be able to say that you've outsmarted the U.S. Empire 13 years after they accelerated their plans to rule the world outlined in their Project for a new American Century document titled 'Rebuilding America's Defenses'. According to the ISIS psyop, that accomplishment alone is worthy of historic recognition. Here's a group of young kids with covered faces who maintain internet accounts without any past due balances, they have wide open social media accounts (Facebook? YouTube? Twitter?) that are also apparently well maintained. They must understand and be properly following the rules of these social media accounts. But wait, if they have social media accounts doesn't that mean that the social media providers are terrorists too? Unless these geniuses called ISIS are also fooling them too. I suppose this would be realistic according to government narrative since ISIS has apparently outsmarted everyone else. Okay, forget social media, how is ISIS able to log onto the internet? Do they have their own ISIS hackers?? Who do they pay their internet bill with? Without internet aren't they lost? No social media and no way of knowing what is going on right? I doubt they have analogue TV in their convoys? Doesn't this present a communication problem? ISIS again quietly has overcome this problem in a flawless and mysterious manner. Amazingly this group of geniuses who have outsmarted the entire global intelligence community seem to have all the capabilities to put the U.S. Empire's CIA and their globalist partners Israel's Mossad to shame. ISIS has put on a clinic and has officially handed the U.S. and Israel their butts in the intelligence department. They not only formed right below their noses, they did it quickly, they figured out unanimously what their mission would be and all agreed on it. Football teams and all sports team for that matter throughout the world could learn from ISIS. ISIS apparently is teaching the world how a team works together. Imagine, the CIA's mainstream media would have us believe that ISIS is powerful and high in numbers. Really? How would you get that many people to agree on anything? Every NCAA coach would learn a lot from ISIS. Here's a group of young face-covered men who actually agree on everything. They even all agree not to attack Israel for no reason at all. How quickly ISIS rose to power and fame and how they operate in such unity should strike everyone as very odd yet the ISIS psyop narrative continues without missing a beat in regards to these technicalities and finer points. Any way we slice it, the ISIS psyop narratives has a group of kids with hidden faces who have revolutionized the concept of "intelligence" operation. They solved the CIA Mossad and NSA problems and now are laughing at the global intelligence community. They did this at a time, by the way, even as uncharged innocent prisoners sit in George W Bush's Guantanamo illegal prison for life. Can you imagine what is going on in the minds of the men in Guantanamo hearing about ISIS? Have you noticed that no one knows who ISIS is? What are their names? Why not snag up one or two of them and let the identities come out? No, not ONE member of ISIS is capturable or identified to the world. It's like they never existed. Not one wife, sister, brother, father, cousin, nephew, aunt, or uncle is speaking out. Apparently they never lived anywhere and never told their friends that they were going to join ISIS. Not one of the has a girlfriend or a spouse that would have spoken by now. No one has come out testifying that ISIS tried recruiting them. Oddly we haven't even heard of an angry former girlfriend speaking out about the initial call, the recruiting effort or anything whatsoever. But without a powerful recruiting effort how did they recruit? Somehow they got around this one too. No one knows how. They simply came into being. Let that sink in. In the age of super advanced government biometric surveillance, tracking and spying, ISIS has one less problem than anyone in America. Unlike Americans who are constantly under the threat of being surveilled and spied on by the U.S. empire, ISIS lives free of the threat of technological surveillance of any kind. For some reason, their images, faces, voices and action are not surveilled, tracked or recorded by those who can do it. "Intelligence sources" are powerless in the face of ISIS. All of the U.S.'s NASA, NSA and USAF technology and equipment makes no difference when it's ISIS. Despite all this, amazingly we hear nothing about the U.S. military or NSA trying to steal or decode the ISIS counter surveillance technology. Oddly the topic of ISIS's amazing counter-surveillance technological abilities is not talked about by anyone in the media or in Washington. Anyone who has served in the military knows that being a soldier makes you hungry. ISIS fighters definitely require lots of food and drinks that keep their energy up. You can't go around killing people just for not being part of ISIS without having plenty of energy and lots of water and drinks. Even in the military, working in the mess hall for some was a career. Why? Because someone has to do it. When I was in the military I remember the supply specialists, their full time job was tagging along in our field trips, making sure the unit had enough food and water. When necessary, the supply guys had to go to work to make sure everything went smooth. So where is ISIS getting their supplies? Who's feeding them with food and water? Do they also own the farms? Do they grow their own food? Amazingly, according to the ISIS psyop they do. Or perhaps their food and water suppliers are all part of a secret operation being hidden by the world's new leader of counter intelligence, ISIS. And speaking of supplies, who's supplying their actual bullets? Ammunition? Guns without ammo are useless so the question is where are thy getting their bullets from? ISIS is a unique group which oddly almost all their goals fit in perfectly with the Bush Neocon plans to militarily control the world. I covered this topic in a recent article. Amazingly, ISIS now happens to hate Russia too, just like the U.S.. What are the odds? Bush Neocons controlling Obama and the globalists benefit greatly from more, not less, terrorism. An end to the war on terror would leave the U.S. without the planned conquering of Syria and Iran and re-conquering Iraq. Without a boogie monster like ISIS to provide the pretext for invading these countries (in some cases, again) the plan has no legs. That ISIS fits in perfectly with the Bush Neocon plans is merely a coincident according to the ISIS psyop narrative. Like Lucky Larry Silverstein taking the day off only on 9/11/01 to go to an appointment after never missing work for years if ever at all. Luck, the narrators of the ISIS psyop would have you believe, is something that just happens and should be accept as is without questioning. But wait, ISIS is so close to Israel, they may attack Israel any given day. Given how fast they move, how well they operate together, their skillful blend of technology and brute force surely they could cause a historic massacre in Israel overnight and leave their trail of blood of large sections of Israel. Isn't that the stated goal of ISIS? IDF and Mossad have already failed to detect or stop ISIS in any way shape or form so I wouldn't expect them to provide much of a challenge for the ISIS powerhouse terror group. Given how brave they are, I would imagine they wouldn't have any problems getting the young men to volunteer for the big Israel attack. The big Israel attack would gain them all the PR and Marketing they need. Isn't that the goal when someone opens up a social media account. Hasn't ISIS demonstrated in the supposed beheading videos that they are serious, they want everyone to know who they are and they want certain things. An attack on Israel would get them everything they want, yet for some lucky reason (luck of the U.S. and Israel) ISIS doesn't seem motivated about pulling off the big damage/low-cost attack on Israel. The Irony gets even crazier here. According to U.S. politicians pushing the ISIS psyop narrative, ISIS is not only unwilling to attack Israel, which they could do in a day or two, they instead prefer to make plans to travel all the way to the other side of the world to attack the world's most powerful Empire of all time. Yes, they would rather risk getting caught, imprisoned or killed traveling half way around the world than to go for an easy quick-strike at Israel. And for good measure, as if to flaunt their super counter intelligence capabilities, they are willing to announce their travel plans to fly half way across the world to attack American cities ahead of time. So this previously incredibly intelligence organization that outsmarted all of the world's intelligence agencies at once, is now giving away their plans before they even happen. Doesn't that sound like a monumental change in intelligence strategy from such a stellar counter-intelligence skilled violent organization? Apparently in the "new" ISIS philosophy they now give away their plans ahead of time knowing that NOT giving away their plans worked pretty well during their secret and rapid rise to power under everyone's noses. Keep in mind ISIS uses U.S. military gear which they accidentally "found" in Iraq. The military gear including tanks, artillery weapons and high powered guns all just happened to work perfectly and for good measure they apparently have all the ammunition to go with these weapons. But wait, you might say, how can ISIS transport huge military equipment to the U.S. to attack the U.S.? Not one U.S. "intelligence source" seems to know the answer to this. Apparently ISIS is not just lucky like lucky Larry, they also have a lot of money which no one seems to know where it comes from and they are very versatile. The ISIS engineers are apparently working on brand new smaller, easier to hide weapons that are not detectable by airport scanners or surveillance cameras. 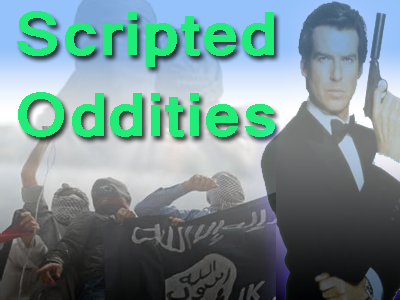 Is ISIS starting to sound like James Bond yet? With this ongoing face-hiding playing out to perfection once again ISIS is schooling the world on how to be a criminal in the face of the global police state and get away with it. Do you realize someone you know or someone they know could be part of ISIS without anyone knowing? Is ISIS really Blackwater? Academi? You know, the U.S.'s private mercenary organization that likes to change its name all the time. Is this the reason why "ISIS" covers their face? Even James Bond could not successfully hide his identity for very long and he's just one person. Remember, we're talking about supposedly thousands if not tens of thousands of young men working as one without one of these men making a mistake. Try to imagine how ridiculous this really sounds. ultimately, as long as secrecy over the faces of ISIS is maintained, we really don't know for sure just who ISIS really is. We know what the federal government would have us think, but humanity as a whole is now moving past this type of solution for procurement of legitimate information. Yes, according to government mouthpiece "experts" like Colonel Anthony Shaffer and others, we (the U.S. "intelligence sources") know a lot about ISIS. They have money, they are organized etc. But think about it, how come they "know" so much about ISIS's financial abilities but don't "know" who funded them or what bank accounts they currently have?? U.S. and its allies' intelligence only "know" enough to scare you with ISIS but not enough to act to actually stop their banking accounts and transactions. That would actually stop ISIS dead in its tracks wouldn't it? But nope, we don't want ISIS to go away to quickly. The script needs to play out doesn't it? This script is indeed playing out and America and the world is the audience watching the show. Those that are awakened stand in dismay at the level of propaganda we are seeing and are wondering what ridiculous narrative will the globalist spin next to get into Syria and continue into Iran?. Others who wanted to believe mainstream media news but perhaps are intuitive enough to not be fooled yet again are scratching their head. We call that the WTF moment. While sadly others, have seen this script before and for some reason they kind of liked it before. Perhaps they love the post 9/11 feeling of believing government and looking to it for protection from terrorism. Perhaps they love the police state and maybe they are comfortable being surveilled 24/7. Perhaps they know that the only way to maintain their sanity and their lifelong and hard-fought-for paradigm is to simply believe whatever mainstream media news says. This third group will welcome the CIA script. It is this group (those that welcome the mainstream media script) that makes this next (information war) chess game between humanity's awakened segment and humanity's governing segment very interesting. This third (asleep) segment of humanity is playing out the last bit of fantasy left in their personal paradigms. Some of them would probably rather die than face reality. Some of them think they are "saving" themselves from reality. Reality, with some of these people thus takes on the role of sin in that they want to save themselves from this consciousness. For others the same reality takes on a role of "insanity". The goal thus becomes to "preserve" their consciousness from this "insanity" or tin foil, crazy, lunatic, "conspiracy theories"- you get the picture. That is how the ISIS psyop divides itself upon humanity. Recognizing the three primary forms of consciousness will help us arrive at a consensus on how to move forward to fix this problem. Let's hope that we (humanity) can figure it out quickly this time and with the fewest amount of lost lives. Let us pray for humanity and for the survival of the human race. Let's remember that all those logos, flags, ideologies, and concepts of governments are all just artificial agreements. Let's all try to see the biggest picture which is that we are all part of a species (humanity) which is actually trying to kill itself off. Let's not let tiny individual samples of our own species ruin it for all of us. They've tried everything they have so they have to start repeating their tactics. They are making the script easier for us all. Let's take advantage of this weakness they are showing. The weakness of lack of creativity. This lack of creativity is glaringly obvious to all of us now. The globalist are not very creative and they like to repeat their tactics. This is why history is a great tool to expose the globalist and their new world order. Its been said and I declare again that those who ignore the lessons of history are bound to repeat it and never has this been more true than today. Here's a word of caution to those who still believe government's ongoing war on terror. Look at the past, look at attacks of 9/11/01, don't you agree it didn't work out very well for us? And on top of that they took all our liberties away. This is a failed government. Are you going to trust them at a game where you are always the loser? Ask yourself, how did their phony war on terror improve your life last time? Why would this next round of ISIS be expected to be any different? Don't you want to thrive while you are alive? Then let go government engineered lies and narratives and see the greater agenda now for yourself. Then share this message with someone.